I'm dealing with a mess-up this morning. A whole "I know you were asking me to do that God, but I completely ignored you," moment. Oh sure, I cloaked my ignoral in a "if you really want me to do it, then give me a shout-out", and when He didn't I conveniently figured He wasn't really calling me out of my comfort zone. What's so amazing is after the moment passed and I left the situation, He confirmed the calling. AFTER I disobeyed. And I looked up and said, "Really? Now you're confirming it?" And He replied, "I'm not confirming anything you didn't already know. You simply chose not to act and I'm showing you what you missed." Sometimes the truth hurts. But it's sure necessary for growth. Because let me tell you, after grieving that moment I resolved to never do that same thing again. And while I would have rather grown my faith by leaping out in it, this time I guess I chose to do it the hard way. ***Sigh***We are going to be human. We are going to mess up. Be frail. Need a re-do. And then still mess up again. And yes, sometimes it's even in the same area. Here's the amazing thing though, even as I grieved, His grace covered me. 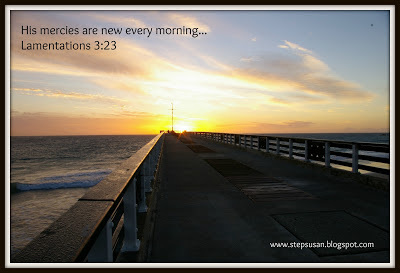 He reminded me that His grace was enough, that His mercies are new every morning, every hour, every second if need be. He reminded me that I can do ALL things through Him who strengthens me--including leaping out of my comfort zone. Then He reminded me of all the times I've done that, overshadowing my mess-up. Because He's God. And He loves me. And He's sees my successes, not my failures. I LOVE this, Susan. For whatever reason, I can be especially reflective on Mondays...there's something so refreshing (though sometimes daunting, too) about starting a new week. Thing is, it generally doesn't take long for me to mess-up once a new week starts...whether it's a poor attitude about the day job or a goal I don't meet, it's SO easy to fall into that, "I failed, I failed, I failed again" misery. But like you said, there's such joy in knowing we're covered by God's grace. And that's what I want to cling to--His grace, not my own successes or lack thereof. Amen, Melissa:) Because as hard as I try, I still mess-up, which is why I am so in love with His grace. Hope you have a blessed week, Susan! Uh-huh, she did put it well, didn't she! Praying you have a great week, too - school's got to be about out. You ready for summer? !